Human Rights Day is a commemoration of the date on which the UN General Assembly endorsed the Universal Declaration of Human Rights (UDHR) in 1948. 2018 marks the 70th anniversary of this landmark document, the first of its kind to declare a set of rights held by each human being on the planet regardless of nationality, race, gender, belief or any other distinction. It put forth an ideal that recognizes us all as part of one human family with each of us deserving of the same respect and dignity regardless of our location or background. Today, Geneva International Centre for Justice (GICJ) recalls many of the situations in which we have failed to protect human rights in places across the globe. As we celebrate the truly historic accomplishment of the Universal Declaration of Human Rights on its 70th anniversary, we want to remember that the struggle for human rights did not end with the UDHR and that there continue to be many victims of human rights abuses today. We believe that by being informed we are better prepared to address the scope of the problems we face as a human society and can better pursue justice for all human rights violations and the ultimate goal of universal respect for human rights. 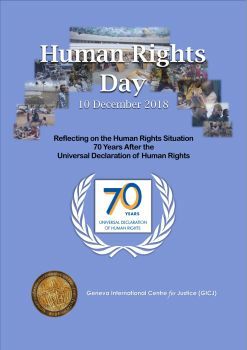 As we celebrate the 70th Anniversary of the UDHR, Geneva International Centre for Justice advocates for stronger efforts on the ground to effectively address human rights situations around the globe. The international community must find creative and effective solutions to prevent future atrocities and horrors from occurring. Finally, GICJ believes that education in all its forms together with opportunities for fellowship among peoples across the globe will bring new successes to the protection and promotion of our universal human rights.